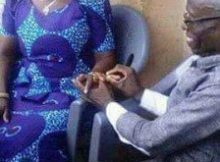 Don’t know how true this is but according to Facebook users, an alleged septuagenarian engaged a lady for marriage somewhere in the south east. ‘AN OLD CRIPPLED MAN ENGAGED TO A YOUNG LADY FOR MARRIAGE!while the lady accepted with joy! AS A YOUNG LADY CAN YOU ACCEPT SUCH A MAN’S HAND IN A MARRIAGE?Be sincere pls? Previous Post:Breaking: Monkey Pox hits Lagos, two suspected cases recorded..